I have been researching my third great grandfather Thomas Frederick Pettit who was born in Stone, Tenterden, Kent circa 1827. His surname is recorded as Pettet and Pettes. He is listed on records from 1871 to 1894 as living in Brighton, which is also my home town. He lived with his wife Mary Jane at 13 St Martins Street in 1871, 6 Scotland Street in 1881 & 4 Quebec Street, St Peters, Brighton until he died on 15 Jan 1894. Their 5 children were: Caroline Agnes A (1871-), Frederick Martin (1872-1929), Philip Thomas (1875-1931), Ona (Ana, Ann 1876-1968) Mildred & Jesse Annie Pettit (1878-1879). Thomas’ occupation is listed as a Chelsea Pensioner in the 1871 Census. In the 1891 Census it is listed at a local port – ‘Alderman at the Nulumbus?’ – Or Attendant at the Volunteer Drill Hall Brighton – it is very hard to read. His death certificate states an Armourer 1st VSO and an Army Pensioner. 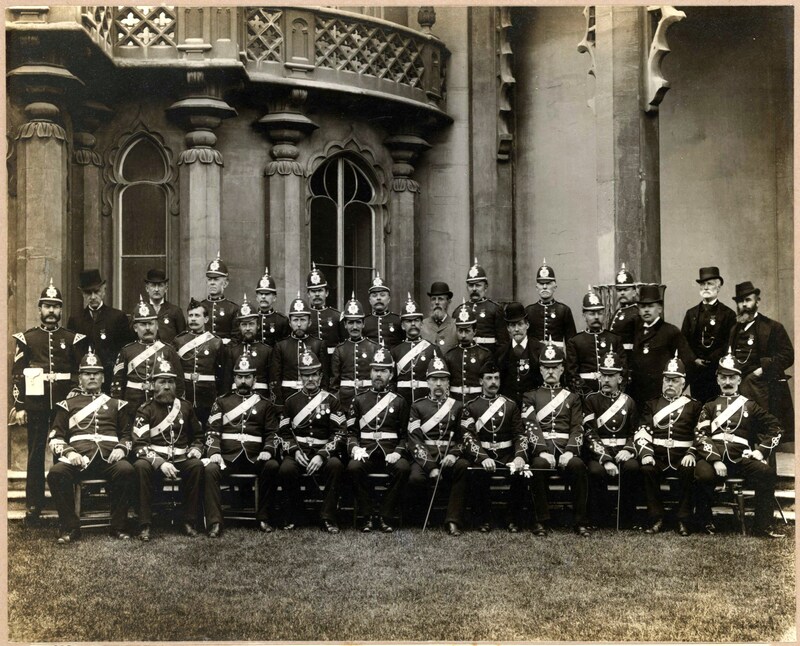 Thomas joined the army whilst underage (15.5yrs n London, Middlesex) and served until he was just over 40 years of age. His 25 years service was in the 35th Regiment of Foot (Infantry) Regiment Royal Sussex from 09/08/1843 – 27/05/1868. Thomas had five good conduct badges awarded and a long service medal. 1st V.B. Royal Sussex Regiment veterans awarded the Long Service Medal. Private Pettit (My 3rd Great Grandfather) is 6th from the left on the back row. In uniform, immediately to the left of the gentleman in civilian dress wearing a bowler hat. My thanks to Andy for this insight into my 3x Grandfather’s role in retirement.